Michael Lapaglia has been racing Yamaha YZ450s during the outdoor season, and you can click the following link to see and hear Michael's impressions on the new 2008 Yamaha YZ450F. 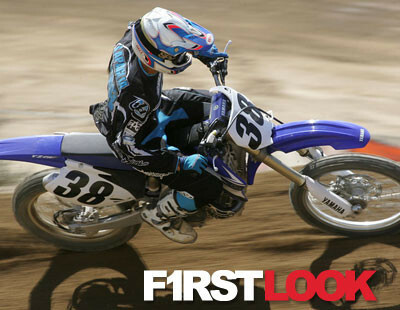 Click the following link for a Photo Gallery of action and detail shots of the 2008 Yamaha YZ450F. As you probably already know, Grant Langston just wrapped up the 2007 AMA Motocross Championship with an impressive run in the last half of the season. Early in the title chase (with the exception of a third overall at Southwick), his overall results were in the 5th, 6th, and 7th-place range. Of course, there were also Ricky Carmichael and a healthy James Stewart to contend with. But suddenly, around Washougal, things rapidly turned around for the South African transplant. He’d have scored the overall in Washington, except for Kevin Windham giving up a spot to Timmy Ferry on the last lap when he mistook the white flag for the checkers. Grant then also scored a second at Millville (behind Ricky Carmichael, who was riding his last National of ’07), and after that reeled off three successive wins at Steel City, Freestone, and Glen Helen to cap the year. Sure, he saw the opportunity to take a title and that provided some extra motivation, but he was also quick to credit a switch to an ’08 Yamaha YZ450F, and its improved handling and cornering habits for quite a bit of the boost in his results. The 2008 Yamaha YZ450F. Take a heavily redesigned frame that improves handling, add a more rider-friendly engine, and blend in an AMA title. So what are the differences between the two? A lot of the change is in the frame, which has modified ribs in the pivot bracket area, along with a 5mm shorter steering head, and redesigned triple clamps…all with an eye toward allowing more flex. Shorter fork tubes also allow more flexibility, and that combination translates into a bike that doesn’t try to stand up and settles into the corners much better than previous Yamahas. Michael Lapaglia adapted quickly to the new Yamaha. While the head tube was shortened 5mm, the bar clamps were raised a nearly equal amount (4mm) to maintain the same rider ergonomics. The footpegs have gotten wider, though, by 10mm, and lowered by 5mm. Compared to the ’06 horsepower monster, the new engine might be considered a bit tame in comparison, but the goal here was to make it much easier to ride. This was achieved through a variety of components, including new cams, CDI and carb settings, and a straightened intake port for improved throttle response in the low-to-mid ranges. The new powerplant is much mellower than the engine offered up just a couple years ago, but it's much easier to ride, both for pros and beginners. Immediately noticeable when looking over the bike is the fact that the silencer is a full six inches shorter than the previous one, which also trims a half-pound of ugly fat from the bike. It also uses a series of tapered and perforated internal cones to keep noise down to the AMA Pro limits. It also uses a high-heat-resistant long-strand glass wool fiber material which is said to last longer, and replacement kits are packed in a polypro bag designed to be easier and less messy, since the bag can be stuffed in the silencer as well, where it will burn off. The old silencer on last year's bike went nearly to the end of the rear fender, so the new compact (and lighter) design is a welcome change. The new silencer is mated to an equally fresh oversize headpipe. Where last year’s pipe stepped from 41.3 to 45mm halfway through its length, the new pipe jumps to that dimension immediately after leaving the exhaust port opening. Check the video for Michael’s comments on the engine (he linked it). Of course, if you prefer a real horsepower beast, there’s no shortage of options for companies to help you build the monster engine of your dreams. The engine plugs in the ignition cover have changed from plastic to aluminum for improved appearance and durability, while the side covers on the engine are now black. You’ll find the usual titanium spring wrapped around the rear shock, while a new linkage ratio provides three percent more leverage at the beginning of the stroke for a softer feel, and six percent less leverage at the end of the stroke for a boost in stiffness. It also results in improved rear traction and bump/jump absorption, and less hop. New smaller axle brackets, new fork guards, new smaller front brake caliper, and a new front Dunlop...there's plenty new here. Up front, the previously mentioned new lower triple clamp has an H-section shape, with revised rigidity. The fork’s piston has a new shape for smoother action, while at the bottom end, you’ll find new, more compact axle brackets, and a shorter axle for reduced weight. Add in a new fork protector that’s lighter and has a new mounting bolt patter, and a different look, and you’re pretty much wrapped up. A bunch of smaller bits and pieces combine to trim a claimed two pounds from the bike, including goodies like a smaller front caliper (from the 250F), and the previously mentioned diet that the silencer went on. Be sure to check the video (see the link above) for Michael Lapaglia’s impressions of the new bike. But we can tell you this…based on urging from Grant Langston, Michael had picked up his own ’08 to finish out the season on before trying out our bike. Based on that ride, he was a happy camper, and looking forward to finishing the season on the big thumper. Yamaha has definitely big strides forward this year in the handling department, and a 100 percent improvement in outdoor titles won department.